Bad lighting may fool you into thinking that your face is clear, that your make up is on point, or the dust in your sink doesn’t exist. Bathroom is the first place you go once you wake up and the lighting in it can make or break your day. Therefore, bathroom lighting needs to be done properly. If you are not satisfied with the lighting in your bathroom, you will have to replace, select, and install the right kind of lighting for your bathroom. There is going to be some cost and work involved and you have to decide whether you will be able to invest the kind of money and time that your installation demands. If you are ready to make the change, go ahead and give your bathroom the adequate lighting it deserves. First you have to be convinced that the bathroom is just as important and just like any other room in the house and that it needs your attention. It is wrong to assume that one main light or fixture in the bathroom is enough for the proper lighting of the bathroom. If you are unsure about how to go about it, you have to start evaluating what you have by taking a look at how old the bathroom is, the style of the bathroom, and you have to start deciding the kind of changes you want. Nowadays, people are designing bathrooms which are a place to relax and unwind. You need to check whether your bathroom has enough light where you shave, where you shower, and where you dress up. Bathroom lighting needs to altered and fixed depending on the mood of the day. You need to choose lighting for your bathroom that complements the aura and interior design of your house. If you don’t want to spend a lot of money, you can update the lighting in your house which will remodel the bathroom. You need to get an idea of the types of lighting available in the market. Recessed lighting: Recessed lighting is also called down lighting. It is installed into a hollow opening in the ceiling. Vanity lighting: It is a light fixture above or alongside a mirror. When you buy LED vanity lights, you save a lot of electricity bill and you don’t have to change it for 8 years. Wall scone: This kind of lighting uses only the wall for support. Mostly the light is directed upwards. Wall scones look attractive and come in different shapes and styles. They are contemporary and sleek. Say yes to LED: LEDs are convenient and effective lights. They are minimal in appearance and don’t have to replaced for years. The light quality in LEDs is much warmer than other lights. Plan for layers of light: A bathroom needs three layers of light to enhance the beauty of the space. Opt for a combination of ambient lights to bring out the bathroom’s design and architecture. Use pendant lighting: Pendant lighting is a good alternative to scones. These lights can also function as ambient lights or accent lights. Choose brass or chrome: Brass or Chrome are versatile and compliment other accessories in the bathroom. It’s best to hire a professional if you want to do a great job of lighting your bathroom. By hiring a professional, you can save yourself a lot of worry and time. Replacing light bulbs and scones could be a DIY thing but when bathroom lighting is redone, it needs professional help. You need to find the costs of the installation and whether you are okay with spending that amount. Use this cost estimator guide to get an idea of what the cost is going to be. Never pop in a dozen of lights as that creates an uncomfortable feeling. Never do on any lighting. Light the vanity area with task lighting and don’t forget to light the shower and tub area too. 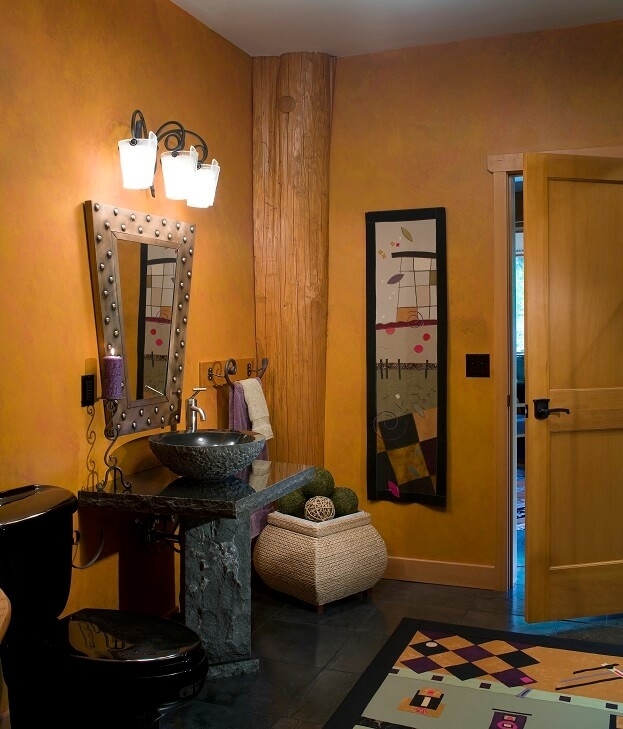 Never place a fixture on only one side of the mirror as it creates uneven illumination. Try tinted windows if you can’t afford frosted windows. 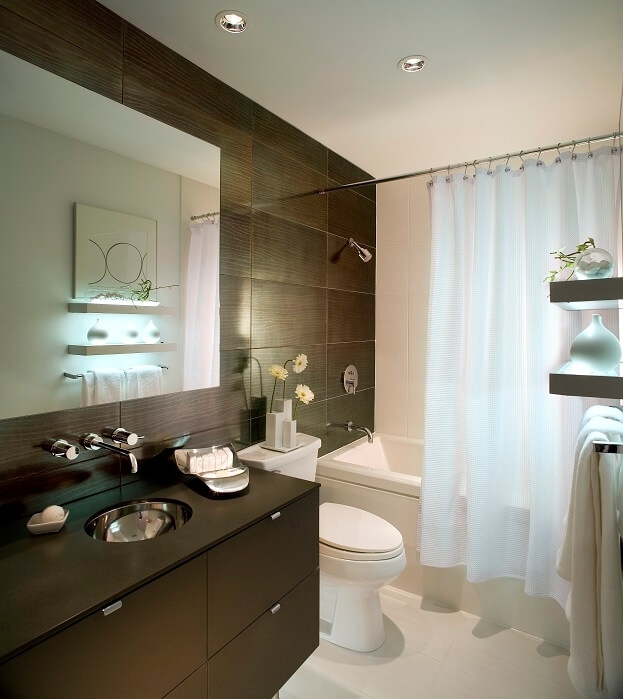 Choose ambient lighting if you want the bathroom to be a relaxing space. Using a chandelier can transform your bathroom and give it a royal feel. Never place a down light near the mirror as it creates shadows on the face. The best thing you can do is try to get as much natural lights as possible. Natural lighting is good for health which helps in better sleep cycles. While all the lighting needn’t be similar, they all need to have the same finish for the bathroom to look beautiful and maintain unity. The right fixture in the right size makes a good statement and sets the tone for the bathroom design.